Amid a sea of glass and aluminium buildings, the Institute of Rural Research And Development (IRRAD) building at Gurgaon looks quite like a yacht sailing against the wind. “The sail-like sunshades are not mere ostentation or drama that people associate with fancy buildings. They are scientifically designed to correspond with the movement of the sun, and keep the summer sun out and the winter sun in, a critical element that governs the working of the building,” says Ashok B Lall, principal architect of Ashok B Lall Associates, which designed the building. In a marked departure from the cold office spaces of multinational companies, the IRRAD building exudes warmth as one walks in. All the areas are sunlit. There is hardly any requirement of artificial lighting during daytime. “The calm and stimulating environment within the building breeds creativity. Even the air quality is better,” says Ramesh Kapahi, director finance and administration at IRRAD. Rated LEED (Leadership in Energy and Environmental Design) platinum, the highest certification for green architecture, the building does not boast anything designed particularly for itself; everything is based on general principles of architecture, but they are applied imaginatively. These days, architects give buildings that stylish look by enveloping them in glass, which traps heat. Then they work out ways to limit sunlight. Owners have to install expensive and energy-efficient air-conditioners. “Start by visualising the envelope as opaque and then make openings just as much as is required,” says Lall. This will invariably limit the window size and ensure that internal requirements like daylight, ventilation and view are just enough. This makes the building energy-efficient, he says. To improve thermal performance, external walls of the IRRAD building have been insulated by padding them with polystyrene sheets. These walls absorb only a fraction of the heat. A unique mechanism called thermal flywheel has been used by modifying the centrally air-conditioning system. Instead of making false ceilings, beams and columns of the walls have been designed to create space for air-conditioning ducts. The ducts cool not just the air but also the built mass, keeping the building cool for a longer period. “We need to run the cooling plant just for two hours in the morning and two hours post lunch,” says Kapahi. 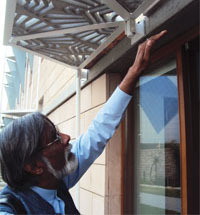 Walking through the building, Lall shows the air-conditioning vents which are placed close to the floor instead of their usual place, near the ceiling. This compliments the nature of air which rises as it gets warm. The cooling plant, therefore, needs to send air cool at about 18°C instead of about 14°C, usually required in centrally air-conditioning system. Every two degree increase in temperature results in 20 per cent reduction in cooling load of the building, states a study by Centre for Advanced Research in building science and energy, Ahmedabad. Presence of ceiling fans in an air-conditioned building may look odd, but combining the two reduces the load on cooling plant further and also counters the staleness in indoor air. The IRRAD building stands out for its minimal use of resource-guzzling material like glass, aluminium and steel. All the door and window fixtures are of timber and double-glazed glass. If timber is properly sourced from managed forests, wooden window frames are almost a hundred times more eco-friendly than aluminium frames, says Lall. Carbon dioxide released in the manufacture of an aluminium frame for a normal sized window is 279 kg, while that of a timber frame is just 12-25 kg. Timber also improves the insulation of windows. The bricks used for construction are compressed earth blocks made on the site itself from the earth excavated from the basement. Parts of the internal wall have been left unplastered to exhibit the earth blocks. The building also extensively uses local stone for wall-cladding and flooring. Construction waste like plywood forms decorative wall panels on the inside. Sunrays are harvested to meet the building’s energy requirements. The 27 kilowatt installed capacity photovoltaic panels harvest 35 kilovolt peak (KVP) electricity. Current consumption is only 12 KVP. Everything, except for cooling plants, runs on solar power. Cooling plants require a specific amount of continuous energy, which solar power cannot provide. Excess energy cannot be sold in market because it is not allowed, and government does not have the infrastructure to buy it. However, says Kapahi, all the energy may soon get utilised in the second phase of the building which is complete now. Water management at IRRAD is impeccable. No water leaves the campus which has a well functioning rainwater harvesting system and wastewater and sewage treatment systems. Clay tiles and open grid pavers—the porous pavements—allow water to get absorbed and reduce the run-off. Moreover, all the sanitary fixtures are water-efficient; urinals are waterless, says Kapahi. The final touch is provided by plantation in and around the building. The main courtyard sits atop the basement in between the two phases of the building. 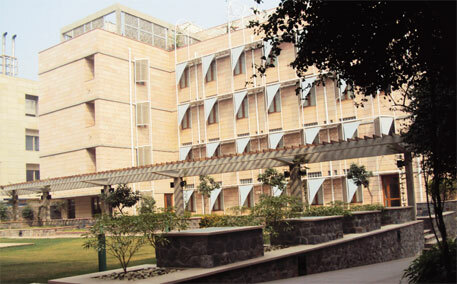 It has a lush green cover with shrubs and small trees. That green buildings are expensive is a myth, says Lall. The extra cost of construction has nothing to do with the incorporation of green features. IRRAD cost slightly more than a conventional building because of the quality of workmanship and investment in renewable energy systems. The total cost for the first phase, says Kapahi, was Rs 33,255 per square metre and around Rs 40,000 per square metre for the second phase. Construction of a corporate office of the highest class would cost just about this much, he says. For Lall, constructing the IRRAD building was like a demonstration project, a proof that building a green building is not rocket science.